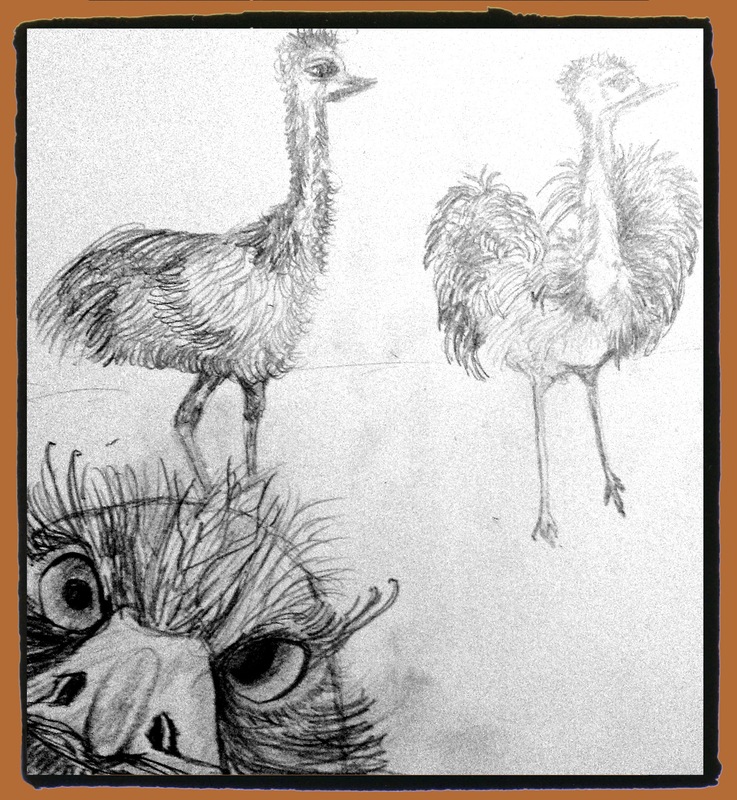 Emus make me smile! A Very Random post! 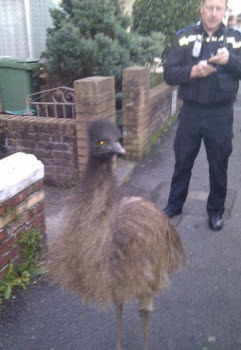 There was a story on the news the other night Monday the26th November about a couple of Emus wandering the suburban streets of Sydney, and then 2 days later another emu was on the loose in Devon England, trying to get into peoples homes, another unlikely place for an EMU! 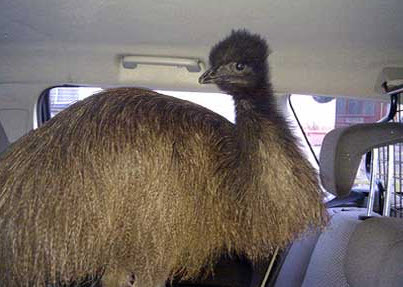 It reminded me how funny these big flightless birds are and how much I love them. They are peculiar creatures, I mean look at that face!! So I thought I would share some thoughts to make you smile too! They are truly Aussie.. they are larrikins but you don’t want to mess with them. They are very inquisitive animals, Sometimes they curiously poke other animals and then run away after getting a reaction, like a little game! if they are being attacked from above by Hawks or Eagles they run off in a zig zag pattern which I think would be pretty funny to see! The Females are typically larger and they are more aggressive than the males when courting. Whilst courting they become more attractive by growing a darker plume of feathers and some of the skin patches under their eyes turn bright blue. The female will perform a dance for the male circling him with her neck turned but rump always facing him. If the Male likes this female he will peck the ground a bit then go and sidle up to the female, swaying his body and neck from side to side and then rubs up against her!! I am sure I have seen this dance in night clubs!! 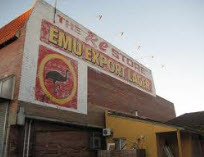 They are on our coat of arms, feature in many a childrens book, are part of Aboriginal Mythology Even have a beer named after them! One Aboriginal Dream time story is that the Emu Spirit used to fly above the earth in the heavens back in the time when the earth was only illuminated by stars, she noted the creation of land, rivers, plants and animals and marvelled at it s beauty.The Emu thought to herself this earth is way too beautiful to be cloaked in darkness so she sacrificed one of her eggs into the sky and tapped it open with her beak as the yoke flowed from the egg into the sky the land became illuminated in gold light and this became the first sunrise. If you didn’t like emus before I hope you do now, quite often they get over looked because our Kangaroos, koalas and wombats are so cute but this flight less bird is true Aussie Icon!